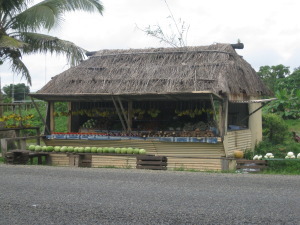 Stepping off the plane at Nandi Airport in Fiji was like a homecoming; a ukulele band was plunking away in the distance, there were lavalavas and bright island prints, there was ululating Pacific language and a warm breeze blew through the arrivals hall. The two hour drive from Nandi to the Uprising Beach Resort took us from one side of Viti Levu to the other and then around the coral coast to the island’s southern side. We slowed for road works, police and military roadblocks, flooded fords, washed out bridges and lumbering trucks laden with long sticks of freshly harvested sugar cane. The long ride was worth it for the close and slow insights into Fijian life. When we first set out in the late afternoon, the countryside was busy with workers cutting and ploughing, some with machines, but more than a few with bullocks, and the roads were blocked by trucks. We passed roadside stores with thatched rooves and groups of women with selling fruit and vegetables from baskets spread out on mats while their children played in the shade of the trees. Then, as the sun began to sink, the roadsides were lined with workers filing home and kids running back from school. Later still, in the twilight, we passed villages where people sat in clusters under trees. We took an enforced detour through the town of Sigatoka, with street markets, crowded shops and crawling traffic. At sunset we reached the coast and followed lines of palms, stands of dense bush, the high fences of luxury resorts and a long stretch of sea, to Pacific Harbour and the welcoming lights of the Uprising Beach Resort.